Rocket Cab: Tweed Extension Cabinet. Solid Premium Eastern White Pine. Beautiful half blind dovetail joinery. Includes speaker mounting hardware, input jack and wire. 100% cotton twill (tweed) USA. Oxblood with Gold stripe grill cloth USA. Vintage leather flat or heavy duty stitched brown strap handle. Chrome glide or black rubber feet. Perfection. Solid, looks fantastic. Well thought out design that was ready to drop in my favorite speakers. Sounds amazing in the recording studio with no odd sounds, buzz, or rattle. The solid wood adds warmth and musical qualities to guitar tone. Substantially lighter weight than my Mesa and Marshall cabs. Currently on their way to a live gig! Awesome product. Thanks Paul! The Rocket Cab tweed 112 extension cabinet is a great match for my Fender reissue '57 tweed amp head. The construction quality is superb and the Celestion Alnico Cream 12" speaker provides excellent tone (even better than a Celestion Alnico Gold). The amber shellac could have been a darker, more yellow, color to perfectly match the Fender tweed head, but I'm not complaining--the cabinet is a great product! I love the look and finish on this cabinet. Works great with my new 15" speaker. I I highly recommend this model and builder. He was great to deal with and very prompt in his responses. If you want the best at a great price, then this is the place to go! Beautiful, lightweight, resonant, sturdy, and at a reasonable price. What more do you want? The cab arrived in perfect condition. It is a work of art! I have not had the opportunity to mount the speaker yet but hopefully will this weekend. The attention to detail that you put into your work is evident even in the brief time I was able to look at it. T-nuts for the handle! Perfect seams! A true 3 piece back option even though it cost more in both time and materials! If it sounds as good as it looks I might just practice more. I wanted/needed a 2x10 American sounding cabinet. How can you get anymore American then a pine, tweed covered cabinet. The workmanship is top notch. The cabinet looks and sound incredible. I needed a small, lightweight cabinet that sounded great and would fit in my small trunk. Paul made the cabinet to my exact dimensions and had it to me in less than three weeks. It sounds and looks perfect. He also has great prices on Eminence loudspeakers too. I would recommend him to anyone. Well made - Great service! Top quality build. Paul was very informative, kept me updated via e-mail and answered my questions. He even went above and beyond, matching the amber tweed finish to my amp. Couldn't be happier! If you're in the market for a solid pine floating baffle cab (my personal preference), then I HIGHLY recommend Rocket Cab! Rocket Cab Model Chicago 2x12 Custom Solid Pine Speaker Cabinet. 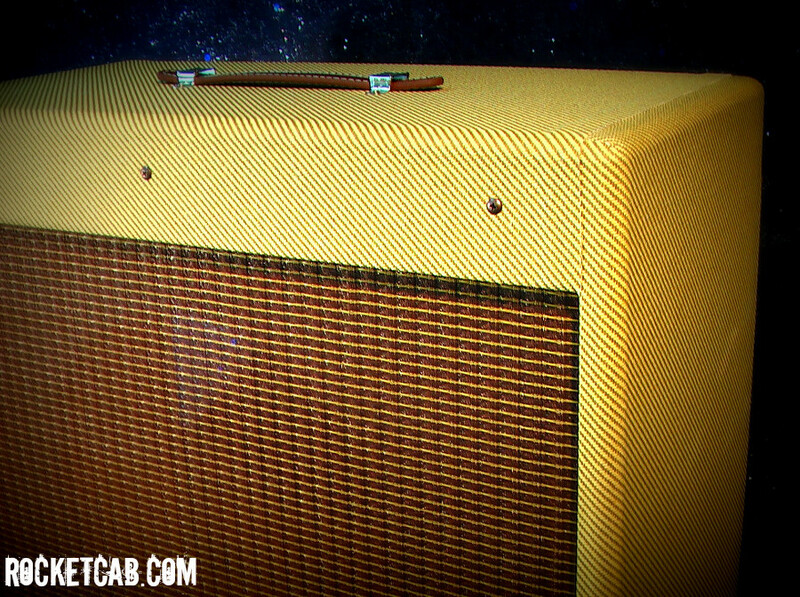 Click the button below to add the Rocket Cab: Tweed Ext Cab to your wish list.